"The young shall replace the old." 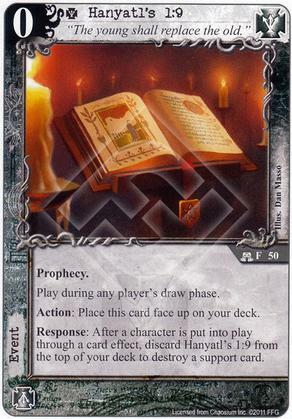 Response: After a character is put into play through a card effect, discard Hanyatl's 1:9 from the top of your deck to destroy a support card. The Dormant keyword is considered a card effect, right? Hanyatl's 1:9 doesn't specify that it has to be a triggered effect, so I assume Dormant would count. Sorry, I am leaning against you here. Dormant:: "When that story is won, you may play that card reducing its cost to 0." While I agree that it is a card effect, I think there is a rules difference between "play" a card and "put into play" a card (see faq section 2.24). If Hanyatl had said "after a character enters play due to a card effect", then you would have been set, since that catches both puts and plays, but with just puts, I don't think it notices the thing Dormant lets you do.